It is recommended to use Docker for security, replicability, development simplicity, etc. Make your FastAPI application a Docker image/container with maximum performance. In about 5 min. (Optionally) understand what you, as a developer, need to know about HTTPS. Set up a Docker Swarm mode cluster with automatic HTTPS, even on a simple $5 USD/month server. In about 20 min. 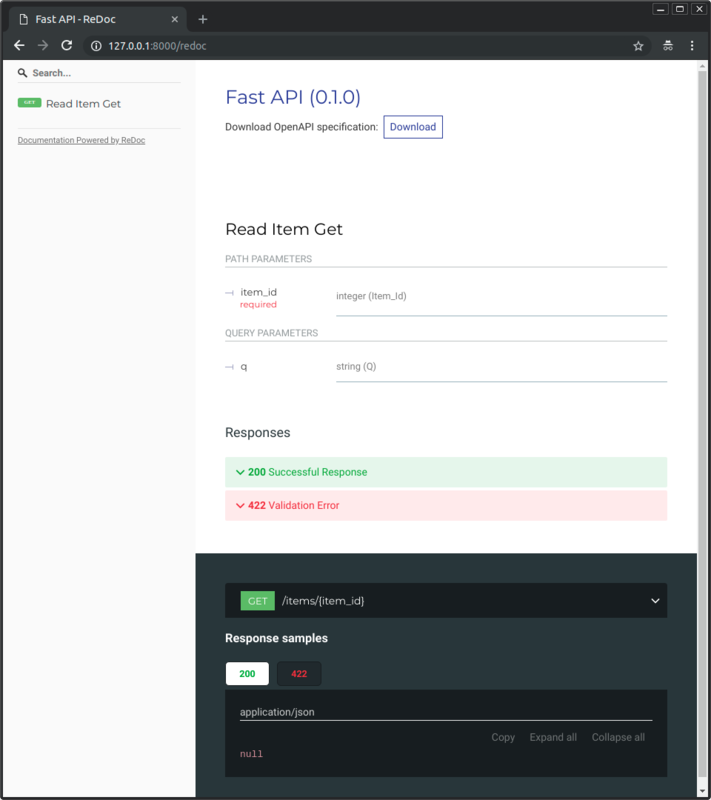 Generate and deploy a full FastAPI application, using your Docker Swarm cluster, with HTTPS, etc. In about 10 min. 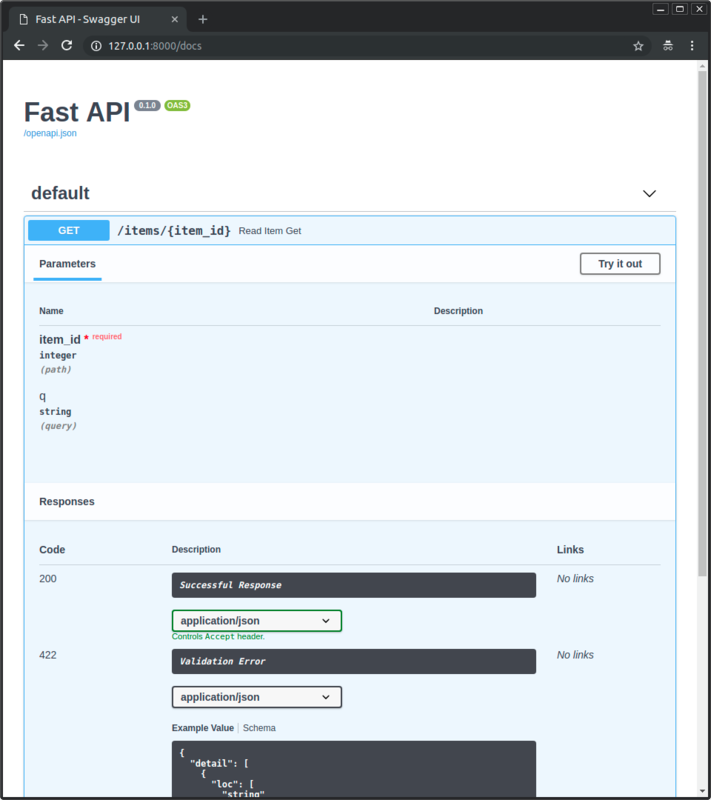 You can also easily use FastAPI in a standard server directly too (without Docker). This image has an "auto-tuning" mechanism included, so that you can just add your code and get very high performance automatically. And without making sacrifices. But you can still change and update all the configurations with environment variables or configuration files. To see all the configurations and options, go to the Docker image page: tiangolo/uvicorn-gunicorn-fastapi. Now you have an optimized FastAPI server in a Docker container. Auto-tuned for your current server (and number of CPU cores). You should be able to check it in your Docker container's URL, for example: http://192.168.99.100/items/5?q=somequery or http://127.0.0.1/items/5?q=somequery (or equivalent, using your Docker host). Now you can go to http://192.168.99.100/docs or http://127.0.0.1/docs (or equivalent, using your Docker host). And you can also go to http://192.168.99.100/redoc or http://127.0.0.1/redoc (or equivalent, using your Docker host). It is easy to assume that HTTPS is something that is just "enabled" or not. But it is way more complex than that. If you are in a hurry or don't care, continue with the next section for step by step instructions to set everything up. To learn the basics of HTTPS, from a consumer perspective, check https://howhttps.works/. For HTTPS, the server needs to have "certificates" generated by a third party. Those certificates are actually acquired from the third-party, not "generated". And then they need to be renewed, acquired again from the third party. The encryption of the connection happens at the TCP level. That's one layer below HTTP. So, the certificate and encryption handling is done before HTTP. TCP doesn't know about "domains". Only about IP addresses. The information about the specific domain requested goes in the HTTP data. The HTTPS certificates "certificate" a certain domain, but the protocol and encryption happen at the TCP level, before knowing which domain is being dealt with. By default, that would mean that you can only have one HTTPS certificate per IP address. There's an extension to the TLS protocol (the one handling the encryption at the TCP level, before HTTP) called SNI. This SNI extension allows one single server (with a single IP address) to have several HTTPS certificates and server multiple HTTPS domains/applications. For this to work, a single component (program) running in the server, listening in the public IP address, must have all the HTTPS certificates in the server. After having a secure connection, the communication protocol is the same HTTP. It goes encrypted, but the encrypted contents are the same HTTP protocol. It is a common practice to have one program/HTTP server runing in the server (the machine, host, etc) and managing all the HTTPS parts, sending the decrypted HTTP requests to the actual HTTP application running in the same server (the FastAPI application, in this case), take the HTTP response from the application, encrypt it using the appropriate certificate and sending it back to the client using HTTPS. This server is ofter called a TLS Termination Proxy. Up to some years ago, these HTTPS certificates were sold by trusted third-parties. The process to acquire one of these certificates used to be cumbersome, require quite some paperwork and the certificates were quite expensive. But then Let's Encrypt was created. It is a project from the Linux Foundation. It provides HTTPS certificates for free. In an automated way. These certificates use all the standard cryptographic security, and are short lived (about 3 months), so, the security is actually increased, by reducing their lifespan. The domain's are securely verified and the certificates are generated automatically. This also allows automatizing the renewal of these certificates. The idea is to automatize the acquisition and renewal of these certificates, so that you can have secure HTTPS, free, forever. Traefik is a high performance reverse proxy / load balancer. It can do the "TLS Termination Proxy" job (apart from other features). It has integration with Let's Encrypt. So, it can handle all the HTTPS parts, including certificate acquisition and renewal. It also has integrations with Docker. So, you can declare your domains in each application configurations and have it read those configurations, generate the HTTPS certificates and serve HTTPS to your application, all automatically. Without requiring any change in its configuration. With this information and tools, continue with the next section to combine everything. You can have a Docker Swarm mode cluster set up in minutes (about 20 min) with a main Traefik handling HTTPS (including certificate acquisition and renewal). By using Docker Swarm mode, you can start with a "cluster" of a single machine (it can even be a $5 USD / month server) and then you can grow as much as you need adding more servers. Docker Swarm Mode and Traefik for an HTTPS cluster. The easiest way to set everything up, would be using the FastAPI project generator. It is designed to be integrated with this Docker Swarm cluster with Traefik and HTTPS described above. You can generate a project in about 2 min. The generated project has instructions to deploy it, doing it takes other 2 min. You can deploy FastAPI directly without Docker too. You just need to install Uvicorn (or any other ASGI server). You might want to set up some tooling to make sure it is restarted automatically if it stops. You might also want to install Gunicorn and use it as a manager for Uvicorn. Making sure to fine-tune the number of workers, etc. But if you are doing all that, you might just use the Docker image that does it automatically.